The corner of the south asle and chancel. The bit that juts up is the base of the chancel arch. Note the herringbone effect of Roman bricks. Not to be confused with the much larger village of Flixton on the road between Bungay and Diss, this hamlet is scattered to the south of Blundeston, west of Lowestoft. In fact, Blundeston Prison is in the parish of Flixton. The church had its roof taken off by the hurricane of 1703, and it was left to fall. The parish was combined with Blundeston. The ruins of St Andrew are marked on Ordnance Survey maps, although they are still quite difficult to find. A week or so after failing to discover any traces of St Peter, Linstead Magna, I set out across the fields along a public footpath from the main Blundeston to Oulton Road. This path follows the driveway of Old Hall, but about 20 yards short of the Hall it diverts to the right, across the fields. As I came into the fields, 100 yards or so from the Hall drive, I knew I was close to where the ruins were supposed to be. But where were they? And then, I took a second look at what I had taken to be part of the hedgerow. Not vegetation at all, but a 6 feet high clump of masonry. I had found it. 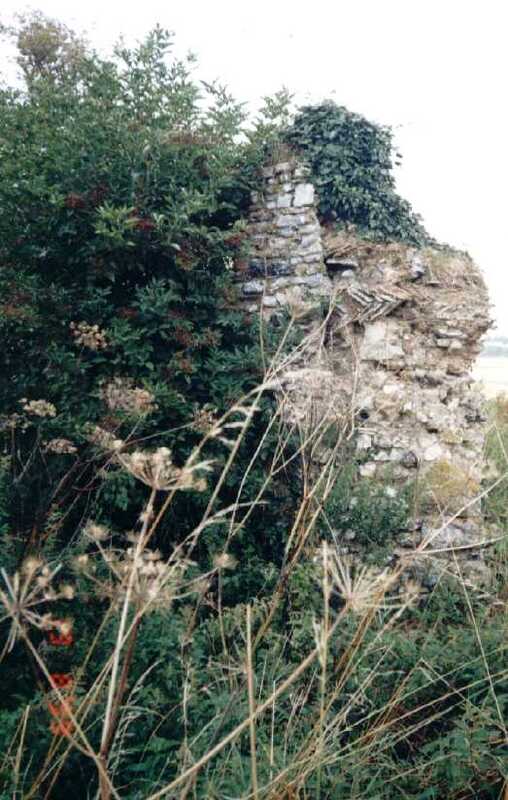 I fought my way through the ground elder, which always seems to infest Suffolk church ruins, and found myself standing by a low wall, almost completely hidden by vegetation. 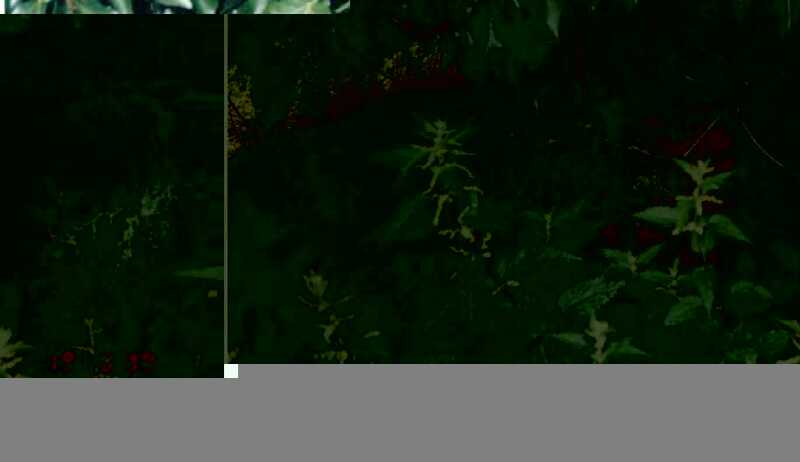 The outline of the nave can be clearly distinguished, and within it there is a rather worrying crypt - be advised of this if you explore these ruins, since they contain what is effectively a pit full of nettles. The rubble core of several pillars can be made out, and the most substantial piece of walling is the six-foot high corner of the place where the east end of the north aisle joined the chancel. This contains several Roman bricks in a herringbone pattern. We are very close here to the Roman fort of Burgh Castle. St Andrew is better remembered than many ruined Suffolk churches. 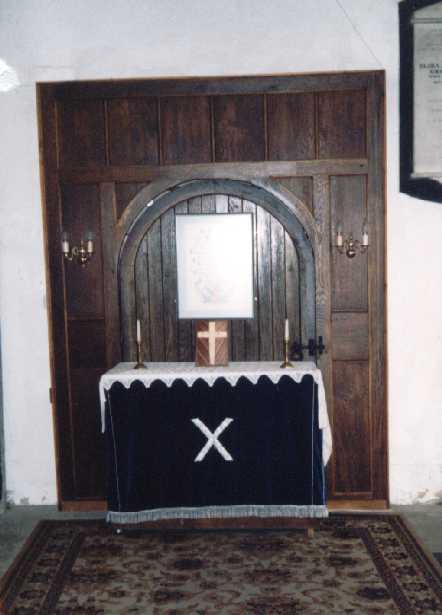 Blundeston church still contains a St Andrew altar in the north aisle, which is occasionally used. And the Flixton font can be found outside the priests door in Blundeston churchyard. 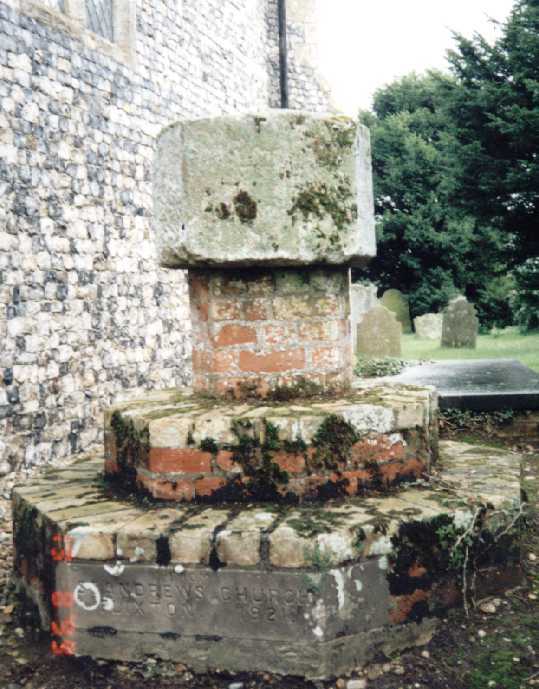 Flixton font, recovered in 1912 and placed in Blundeston churchyard. There is something indescribably melancholy about the ruins of St Andrew. 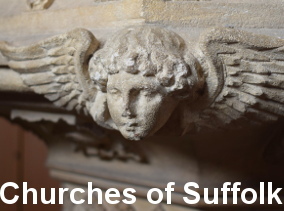 They are not sanitised as at Stanton St John or Westley, or of course, the great Abbey at Bury St Edmunds. They are not completely forgotten, as at Linstead Magna. The St Andrew altar against the north wall of Blundeston church. Yet here they are, not half a mile from the B1074, gradually reducing, year by year, until nothing will remain. Little Livermere will one day be like this, as will Mickfield, and any other church that is abandoned. Which, of course, sounds terribly sentimental. But churches are sentimental places. The parishioners of Flixton still have their altar in Blundeston church, which is also their church. I wonder how many of them ever make the walk up to their own church, last used nearly 300 years ago? The rubble-core of a pillar peeps through the nettles and ground-elder at St Andrew, Flixton.